After a very busy week, I’ve suddenly had the happy realization that ZooCon ’13 (in Oxford) is tomorrow. Okay, it’s not like I had completely forgotten about it – I’ve been thinking about what I want to say in my talk and discussing the schedule with the other organizers for a while now – but what a lovely feeling to suddenly connect that the thing you’ve been looking forward to as an opportunity to meet some interesting people and talk about interesting stuff is less than 24 hours away! There’s still time to register: just go to the Eventbrite page and sign up (it’s free!) and we’ll see you tomorrow. I’m planning to talk mostly about the future of Galaxy Zoo, including CANDELS and other projects as well as interesting new tools to enable different kinds of collaborative science, including volunteer-led science. But I’m most looking forward to the other talks, which will include updates from Old Weather, Space Warps and Planet Four. On Saturday I gave the after dinner talk at the British Astronomical Association (BAA) annual weekend in Winchester. At the BAA they call this talk the Alfred Curtis Memorial Lecture in memory of Alfred Curtis – a former BAA member who was instrumental in setting up the BAA annual weekend. Many of the audience guessed in advance that I would be talking about Galaxy Zoo, despite my slightly cryptic title – “Finding Spirals – How to Look at a Million Galaxies”, and many of them told me afterwards about their involvement with Galaxy Zoo. We caught the end of the 100 hours of Astronomy drive (although after the 1 million classifications goal was met) so I advertised that in the talk, hoping to inspire some new Zooites. The aim of my talk was to show all the interesting thing we can learn about galaxy formation and evolution from galaxy classifications. Rutherford famously said “All science is physics or stamp collecting”, my talk was in defense of the great physics you can do after you do some stamp collecting and sort out your album! I started by introducing the basic classifications of galaxies, and going back to the original 1926 paper by Edwin Hubble about galaxy classification. I then talked about the basic picture we have for galaxy formation and evolution in our expanding universe in light of the differences we observe between the two main classes of galaxies, such as spirals being mostly blue and solitary (or at least not in large clusters), and ellipticals being mostly red and in clusters or groups. I then talked about the digital revolution in astronomy and how we now have catalogues of millions of galaxies which astronomers cannot hope to visually classify themselves. Of course this is where I started talking about Galaxy Zoo with lots of stuff about how popular it is, and all the exciting discoveries that have so far come out of the first phase of Galaxy Zoo. I talked a little bit about my own work using Galaxy Zoo, looking at how the colours of the spirals vary with viewing angle. I finished by advertising Galaxy Zoo 2. I talked about some of the impressive statistics (like passing the 20 million clicks mark), and showed some of the examples of successful classifications. At the very end I showed a sneak peak of the Google Earth Tour of spiral galaxies which Ben Hoyle and myself made at Portsmouth. You can see this for yourself once you have classified at least 100 galaxies in Galaxy Zoo 2. 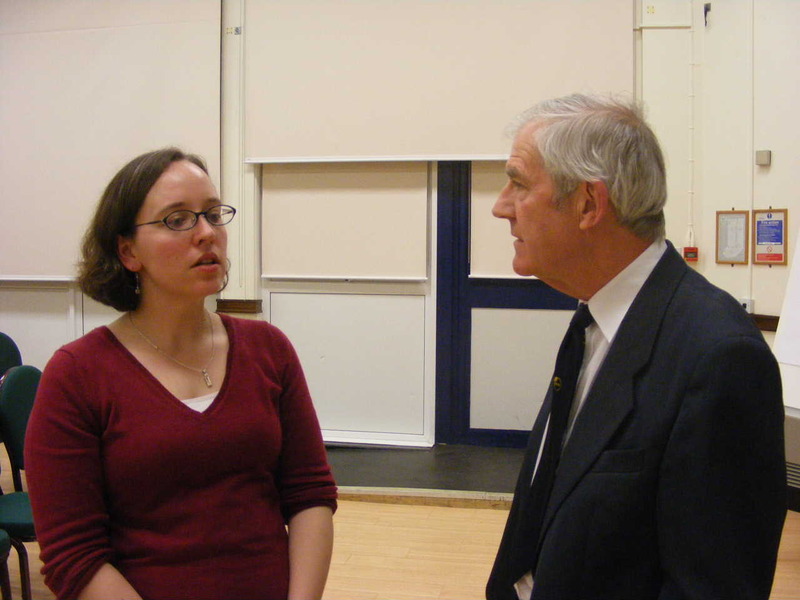 Edit: a picture of BAA president, Roger Pickard and me deep in discussion about Galaxy Zoo. Chris told me in the pub yesterday that “it’s nice to give a Galaxy Zoo talk where people are already familiar with the story; it means that people already know the story.” That’s a testament to the success of your classifications — from what I’ve seen at this meeting, it seems that in just a year and a half, Galaxy Zoo has gone through evolved from a cool new strategy for doing science to a source of exciting research results. The results Chris presented about red spirals were particularly interesting. Karen Masters has blogged about these red spirals before. Spiral galaxies usually contain lots of young, blue stars, but these “red spirals” contain old, red stars. What this means is that the formation of new stars in these galaxies has been shut off. Galaxy Zoo’s contribution — your contribution — has been to show that red spirals most often live at the edge of galaxy clusters. They are clusters that have just begun to move toward the centers of clusters due to the clusters’ gravitational attraction. The attraction of the galaxy clusters has led to new star formation being shut off, but not to the shape of the galaxy changing — a process that Chris called “gentle strangulation.” The gravitational attraction is just right — enough to shut off star formation, but not enough to deform the galaxy.